Reunion Weekend 2019 will take place June 7-9, and this year we celebrate our alumni from the Classes of -4s and -9s, from 1944 all the way up to 2014! We can't wait to welcome you back to campus! *Be sure to check your Class Page for additional information and details! *A formal invitation will be delivered in April. 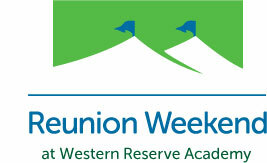 *For further questions about Reunion Weekend, contact Abbey Baker ’94 at (330) 650-5807 or bakera@wra.net.